Hipex-RC provides ways to reduce the size of a parasitic RC netlist for post layout simulation of a large layout block. One of them is the selected nets extraction function. This function is effective for reducing the run time of Hipex-RC. When this function is used, Hipex-RC extracts parasitic resistors and capacitors only for the selected nets of the critical path. -Open the "vref" cell as shown in figure1. -Select the menu item Verification->Extraction->Setup , or click the "LPE setup" icon. Select "Technology" and specify the three files in "hipex" folder as shown in figure2. Make sure the following settings are specified. Hipex-RC can annotate schematic net names to the parasitic RC netlist for post layout simulation. 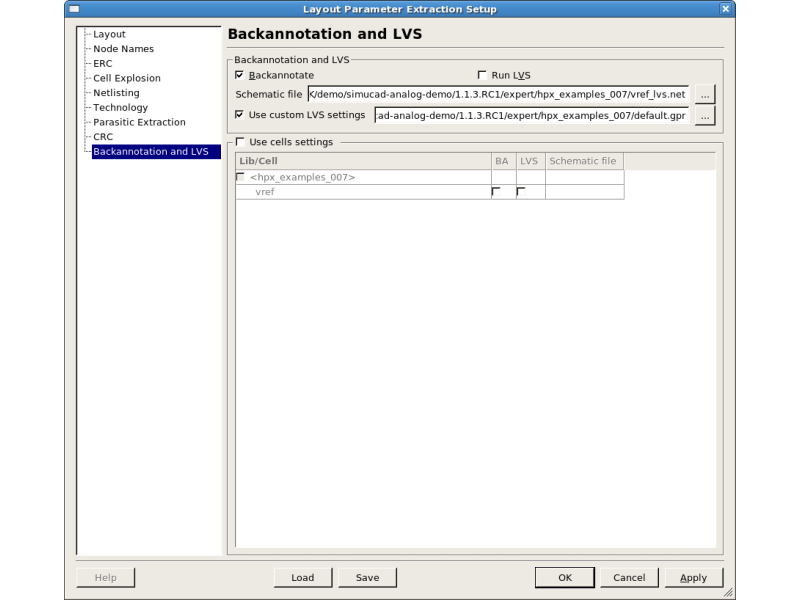 Select "Backannotation and LVS" in the "Layout Parameter Extraction Setup" window. 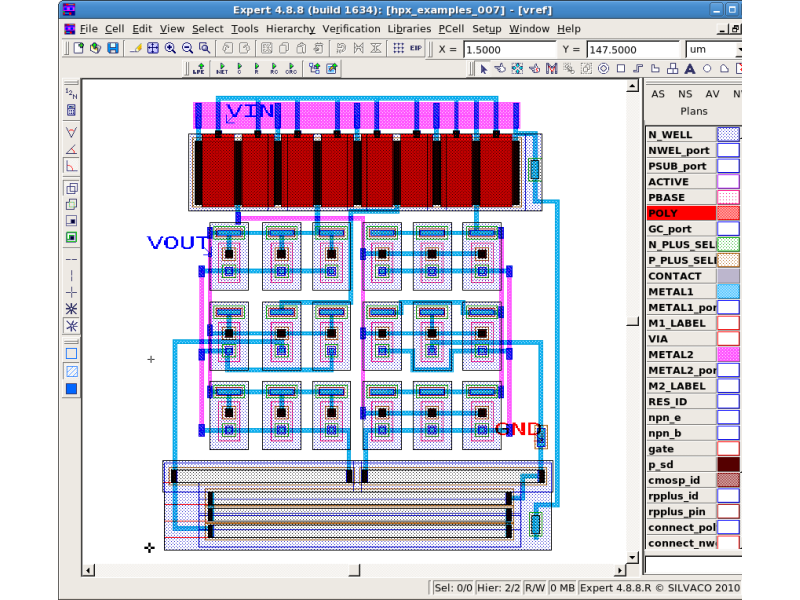 Setup the schematic netlist and the LVS settings file as shown in figure3. (The LVS settings file is saved in advance when the LVS verification with Guardian LVS is passed). Select "Parasitic Extraction" in the "Layout Parameter Extraction Setup" window. Check the "Selected nets" and "BA names" checkboxes. Add target net names in the schematic as shown in figure4. Namely, select "NET6","NET8", and "VOUT" as the selected nets. Select the menu item Verification->Extraction->Hipex-NET->Run , or click the "Run netlist extractor" icon. A layout netlist is generated as a result. Then, select Verification->Extraction->Hipex-RC->Run , or click the "Run Hipex-RC" icon. 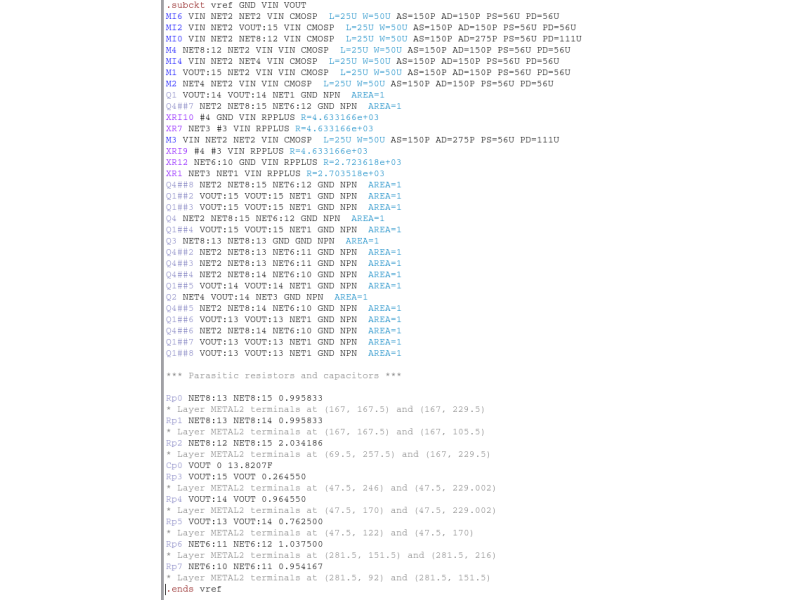 The parasitic RC netlist as shown on figure5 is generated. The netlist shows the extracted parasitic resistors and capacitors related only to the three nets. Hipex-RC provides not only the selected nets extraction function but also the ignored nets function. When this function is used, Hipex-RC doesn't extract parasitic resistors and capacitors for the ignored nets. An example setup is shown on figure6. This function can be used in the same way as the "selected nets" function, and is just as useful. TechnologyID = "Silvaco BCD (analog demo PDK)"
Derive = "Copy: Layer=substrate, LayerR=PASS;"
Derive = "Copy: Layer=substrate, LayerR=CVD_2;"
Derive = "Copy: Layer=substrate, LayerR=CVD;"
Derive = "Dif: Layer1=substrate, Layer2=METAL2, LayerR=inv_m2;"